Kids' Book Review: Review: What Pet Should I Get? Review: What Pet Should I Get? 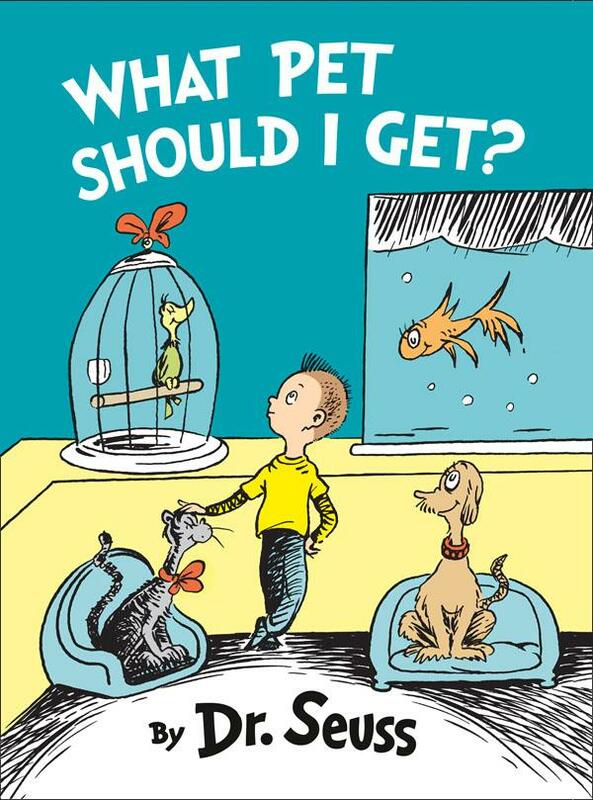 Isn't it just sheer delight to enjoy posthumously-published works by the great Dr Seuss (aka Theodore Giesel)? Shortly after the author died in 1991, his wife Audrey discovered a box crammed with current and past projects. It was put aside and rediscovered by Ted's longtime friends Audrey and Claudia Prescott in 2013, and one of treasures inside was the manuscript and line art for What Pet Should I Get? Ted was a real animal lover, and this fabulous rhyming tale features all manner of creatures as two kids head to a pet shop to decide which pet would best suit their needs. Additional text at the back of the book provides fascinating information about Ted's life, his beloved dogs, and how this latest book came to be. Cathy Goldsmith, Ted's last art director at Random House, was obviously thrilled with the new find, and it was she who recognised the characters from What Pet Should I Get, as the same boy and girl from One Fish Two Fish Red Fish Blue Fish. She therefore felt certain the work dated from between 1958 and 1962, Cathy decided to colour the artwork in similar tones to One Fish. 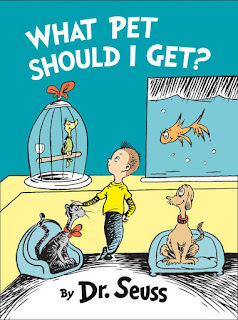 The result is an authentically-created book that sings and zings with the same verve and characters as each of Seuss's predecessor works. Another fine tome to add to the Theodore Geisel collection. And here's to hoping that box contained a heck of a lot more. Title: What Pet Should I Get?